The winter issue of Nutrition Frontiers celebrates the beginning of 2019 and showcases the potential beneficial effects of a dietary pattern of whole grains, legumes, fruits and vegetables, the association of sugar sweetened beverages with increased prostate cancer risk, and implications of a high sugar diet in reducing neuroplasticity. Meet our spotlight investigator, Dr. Andrew T. Chan and his research on the interaction of diet with the gut microbiome and colorectal cancer. Learn about fennel, the crown of delicacy, upcoming announcements and more. Little is known about circulating plasma bile acid concentrations and their capacity to be modified by diet, particularly diets high in whole versus refined grains. Ginos and colleagues conducted a secondary analysis from a randomized controlled feeding trial in healthy adults, who, in a crossover design, were fed 1) a whole grain diet (WG), low in glycemic load (GL), high in whole grains, legumes, and fruits and vegetables; and 2) a refined grain (RG) diet, high in GL, high in refined grains and added sugars. Concentrations of the bile acids taurolithocholic acid, glycocholic acid, and taurocholic acid, were higher after the WG compared to the RG diet. These bile acids are known to activate farnesoid X receptor and G protein-coupled bile acid receptor 1, which play an important role in glucose and lipid homeostasis. These signaling pathways may contribute, in part, to the beneficial effects of a dietary pattern of whole grains, legumes, and fruits and vegetables. There is limited evidence suggesting that consumption of dietary added sugars is associated with some types of cancer, such as pancreatic and breast cancer. However, little is known about whether added or concentrated dietary sugars influence the development of prostate cancer. 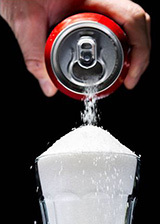 Miles and colleagues examined the association between concentrated sugars in beverages and desserts and prostate cancer risk in men in the usual care arm of the Prostate, Lung, Colorectal, and Ovarian (PLCO) Cancer screening trial. They found that consumption of sugars from sugar-sweetened beverages was positively associated with an increased risk of prostate cancer for men in the upper quartiles of sugar intake. There was no association between consumption of sugars from fruit juices or dessert foods and prostate cancer risk. Limiting intake of concentrated sugars from beverages may be important in the prevention of prostate cancer, however, more research is needed to confirm these findings. The Western Diet (WD) may alter the gut microbiota and has the potential to affect cognitive health. Jena and colleagues evaluated a high sucrose and moderate fat WD or a control diet (CD) in wild-type mice. Isolated microglial cells revealed WD-fed mice had increased mRNA levels of proinflammatory gene signaling (Il1b, Il6, Tnf-a, Foxp3, Saa1, Ccl17, Ccl20, Icam1) in the brain, ileum, liver, adipose tissue and spleen accompanied by microglia activation, which indicated increased systemic inflammation. Compared to CD-fed mice, WD-fed mice had decreased levels of brain-derived neurotrophic factor (Bdnf) in the brain, microglia, liver, and adipose tissue; reduced postsynaptic density-95 (PSD-95) and activated ERK1/2 in the brain suggesting altered synaptic plasticity; and reduced signaling regulated by bile acids (BA) and retinoic acid, both necessary for normal function for metabolism and anti-inflammation. A WD intake caused dysbiosis and dysregulated BA synthesis with reduced endogenous ligands for BA receptors. Additionally, the WD resulted in systemic inflammation, microglial activation, and reduced neuroplasticity. More studies are needed to assess WD-associated dysbiosis and dysregulated BA synthesis and the link between diet, microbiota, and cognitive health. Andrew T. Chan, MD, MPH, is a Professor of Medicine at Harvard Medical School, Chief of the Clinical and Translational Epidemiology Unit, and the Program Director for gastroenterology training at Massachusetts General Hospital. As a clinical gastroenterologist, Dr. Chan specializes in familial gastrointestinal cancer syndromes and cancer prevention. Dr. Chan is a leading investigator in the epidemiology of colorectal cancer and other digestive diseases, with a focus on chemoprevention with aspirin and the interaction of diet with the gut microbiome. He has published over 385 papers in the field of colorectal cancer and other chronic digestive diseases in leading journals. Dr Chan is a section editor for Gastroenterology, serves on the editorial board of Cancer Prevention Research and Cancer Epidemiology Biomarkers and Prevention, and is vice-chair of the Gastrointestinal Oncology Section of the AGA. He was recently awarded an R01, Dietary Sulfur, the Gut Microbiome, and Colorectal Cancer. The fennel plant, Foeniculum vulgare, revered by the ancient Greeks as a symbol of strength and success is a native herb of southern Europe and the Mediterranean region. Long valued for its culinary versatility and its medicinal value, fennel has a non-overbearing light licorice flavor due in part to its unique combination of the phytonutrients rutin, quercetin, a variety of kaempferol glycosides and anethole. Fennel is entirely edible! It’s seeds, produced by the plant’s yellow umbrella-like flowers, is one of the primary spices in Italian sausage and used frequently as a digestive aid. Fennel’s fronds make a delicate garnish and its thin ribbed stalks and greenish white bulb, known as the “crown” can be eaten raw or cooked. However it is prepared, fennel offers a heaping hand of vitamin C, potassium, folate and fiber. This winter, enliven salads and brighten other dishes with shaved or thinly sliced fennel bulb or stalk. Use fennel fronds to embellish sandwiches, salmon, or plain yogurt and even try a few digestive fennel seeds as an after-meal breath freshener to weave in a delicate flavor to your day.